Over the last 2 days we ferried up the type 1 and then the top ballast for the section nearest the platforms. 6 lorry loads of type 1 were ferried in from the 'car park'. The back end is now covered in track ballast, the foreground in type 1, with a second layer going on today. The roller is for compressing the type 1. Long shadows here; it's still early in the morning, but we are already well advanced. Dismount, stand by the side of the footpath. A gift was left to us by two of the many dog walkers that use our permissive footpath. By mid morning, most of the supply pile was used up, and here the tips have nearly reached the horse dock headshunt, where the big conrete pad is about to be poured. We then received a return delegation from the Swanage PWay dept - in their own, lettered van, jealousy all round - and we gave them a tour of Broadway, a trackbed walk to the railhead, and a jolly sandwich lunch in the PWay mess coach at Toddy. Talking to your fellow railways invariably bears fruit somehow. They admired the degree of our volunteer input, and retuned to Dorset well pleased wih their day out. The idea is to remove the temporary bolts that hold the assembly together, and one by one replace them with proper rivets. Here a bolt is being removed. The bottom two are already done. The bolt hole is tested with a cold rivet, and reamed out using the air powered drill where necessary (usually). The rivets used are in two sizes - 5/8ths and 3/4 inch, depending on the job. The truss on two trolleys is then rolled under the riveter, which is carefully lowered to just the right height. The business ends are changed according to the size of the rivet, here being tested, so that nothing goes wrong with a hot one. Each rivet is heated with a gas burner. Not the blacksmith's forge then, we light the torch just when it's needed. On the signal, quick as a flash, the 'dentist' with a nasty looking pair of nips picks up the red hot rivet and inserts it into the hole. You drop the rivet, it rolls around the floor. The 'dentist' picks it up again with the nips, and inserts it into the hole a second time. Drops it once more. Now it's too late, it has to go back to the torch to be brought back to temperature. Second attempt! Stand well clear out of his way, if you don't want a rivet shaped hole in your overalls! Every second counts here. Aim carefully, shove it in part way, help it along home with a tap of the nips, ready with the riveter! It takes quite a bit of practice to get this right. With the lever on the right you can close the jaws and apply a mounting pressure on the hot, soft rivet. Right at the end of the squeeze, the pressure goes up to an impressive 40 tons. This canopy isn't going to fall apart. Here's one we did earlier. Isn't it beautiful? All done by the GWSR Toddington loco dept, these guys are building up an excellent reputation building Broadway's heritage canopy. What else might they be able to make? After doing the apex of the truss, the assembly is turned upside down and pushed back into the jaws of the riveter for the last row along the bottom. It's Steve from the PWay pushing, so we all lend a hand. This sort of stuff unites us. The jaws are manoeuvered back into place to do the last row. Yesterday, the team did a complete truss, so 6 more to go. Outside, a few we did earlier. This is an impressive stack of assembled purlins, all rivetted and painted. By the workshop doors, the final two trusses are ready for riveting. They were assembled at the beginning of the week. All the assembly work now looks to be complete; lots of riveting still to be done, and we are awaiting the arrival of the archged ridge purlins from a fabricator. Back at Broadway north. Here is the opening view at the beginning of the day. All the type 1 is now in, with a last load still in the 9 tonner, which will shortly be tipped on to the stockpile on the left. Today we will cover this with the final layer of track ballast, which should complete the stretch as far as we are able to go (say up to the roller on the left). Nearer than that and various huts are in the way; also the construction of the big concrete slab on the right will disturb the ballast if we put any down here now. With no further ballasting yesterday afternoon, Steve took the opportunity to fetch more rail from Childswickham. As opportunities present themselves, he is building up a stockpile here, bit by bit. Will she fit through the gate? It doesn't look like it, but as you get nearer there is a little room each side after all. Then, a two point turn at the top, and off down the trackbed, over the road bridge, and through the station. The weather is fine and dry today. Look behind you! The drawbacks of nice, dry weather are these clouds of dust. By lunch time, we had dealt with the 6 loads in the 'car park' and given Steve quite a bit of levelling to do. We are nearly at the station end of the stretch here; behind Steve is a long stretch of double trackbed ready for rails. We were about to stop and do something else, when the cavalry arrived in the form of another lorry from the Forest of Dean. The 360 digger was just scraping together a remainder, when more ballast arrived. Phew! Then, in quick succession, another, another and another. That makes 10 lorry loads today. At £500 a lorry load, this could be £5000 spent today, where did it all go? And we've been doing this for almost 2 weeks. Have you bought some more shares yet? Broadly speaking, we have now completed the ballast excercise at Broadway north, there won't be any more dumper trips for a while and Big Bertha has been taken off hire. We need to get more rails in, as the embankment behind this lorry is about to be closed off for the soil nailing excercise. This will take 3 months, and we will not be able to use the trackbed, or the 'car park'. We will busy ourselves with bringing the railhead nearer, more CWR welding and stressing, and if we run out of things to do, we might build us a buffer stop or two at Springfield Lane. We could also have made these ourselves, but a decision was taken to get a fabricator in, to hurry things along. 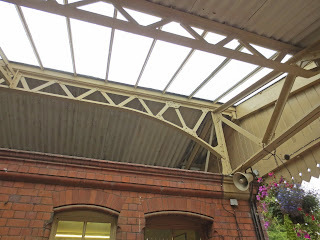 Just to remind you, what is this arched ridge purlin, you can see one here in the original canopy at Toddington. On the right is a truss, at the top a purlin, such as the ones in the pile painted green. Remarkable, and rather beautiful, isn't it? That certainly is SOME tonnage of ballast moved into position!! The Roof metalwork is looking better and better. Just need some fine weather now to get the cobelling done on top of the building and the roof trusses can be fitted. Any idea how you are going to move the parts up to Broadway? I would suggest moving them by rail but you are the experts not me. Anyway, a hearty well done on the project so far. Regards, Paul. Amazing work by you all. I am in much admiration of the standard of workmanship done by you all, Its all coming together very well, keep up the pictures they are really telling te story to what is being done on the line. Well done all. The trackbed,between the platforms,and Springfield Lane bridge,certainly looks MUCH better,than it did,a few weeks ago!.Well done!,to you for shifting all that ballast!.I'd imagine,that the handles,of those nips,used for holding those rivets,must get a little warm,after a while!.Are the arch purlins,ready riveted?.Or have they just been bolted?. Anthony. The ridge purlins also need riveting. They will continue next week. Dog mess is such a contentious issue. Stick up a sign warning dog owners about this. 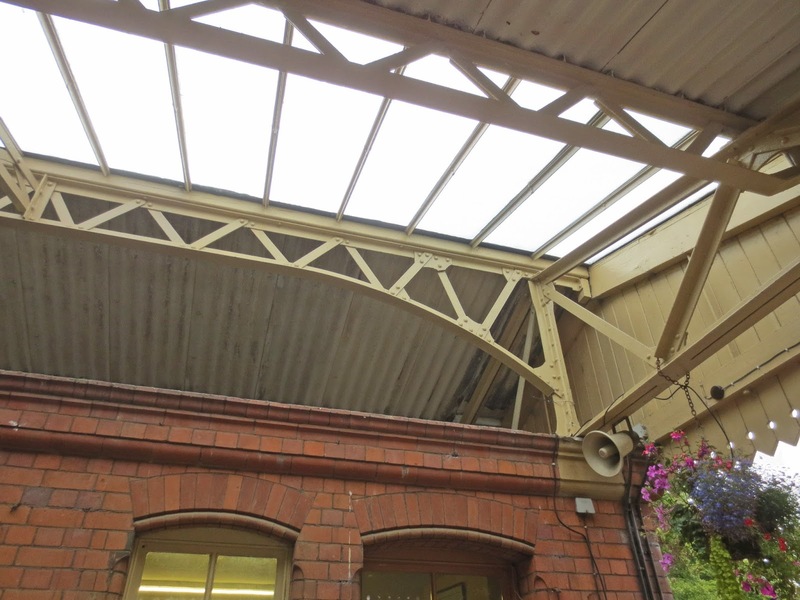 Way back in 1976 Snow Hill was condemned because BR alleged that the rivets were failing in the roof structure. It was then in use as a car park. What a tragedy it was not repaired! The following year I watched them pulling it down & it did not come down easily so were the marked rivets just an excuse? Excellent blog as ever Jo. Will the permissive footpath remain open whilst the embankment works are carried out?